In the Texas border town of Frontera, Sheriff Sam Deeds (Chris Cooper) digs up the past when he finds an old skull in the desert. As he traces the murder of Sheriff Charlie Wade (Kris Kristofferson) 40 years earlier, Deeds' investigation points toward his late father, the much-loved Deputy Buddy Deeds. Ignoring warnings not to delve any deeper, Sam rekindles a romance with his high school sweetheart while bringing up old tensions in the town and exposing secrets long put to rest. Roger Ebert Review: "Lone Star” is a great American movie, one of the few to seriously try to regard with open eyes the way we live now. Set in a town that until very recently was rigidly segregated, it shows how Chicanos, blacks, whites and Indians shared a common history, and how they knew one another and dealt with one another in ways that were off the official map. Anthony Leong, Demystifying Lone Star: A continuum is also established between the law and justice. Sam starts off at the beginning of "Lone Star" unable to differentiate between the two, which he believes are one and the same. However, as he delves further into the history of Rio County, he finds that the two are on opposite ends of a spectrum, and that everyone he knows is somewhere in between the two. I haven't seen this since it came out, but remember teenage me thinking it was a perfect movie. One of the late, great Elisabeth Pena's finest moments. I love John Sayles, and I'm a sucker for this kind of intergenerational explorations. Chris Cooper and Elizabeth Peña make the film work, and Matthew McConaughey is great in it as Buddy Deeds. I love Lone Star. The way the broad range of characters overlap and interact is just amazing, like a puzzle coming together, but not so neatly as to throw off the realism. To me, Lone Star, Rone Inish, and Passion Fish are Sayles' three masterpieces. Well, and Brother from Another Planet. Most of his earlier work I like, but it's so rough, and never clicked for me. Everything after Lone Star I thought pretty much flopped. Like, they were just ideas, but without real umph, even though they tend to have great actors. I remember this as a great "slow burn" movie, and Kristofferson as fabulously evil. Also the twist at the end is handled in a kind of quiet thoughtful way that gives you something to chew on for a while. Now I want to watch it again! This such a good movie. Sadly, it seems to go forgotten by so many. The soundtrack is damned good, too. I love this movie. It's one of the better movies about small Texas towns that I've seen, and it made me notice who Chris Cooper was. I always like Elizabeth Peña, I knew she had passed but not the reason why. I'm pleased to see one of my 'desert island movies' featured here. I probably re-watch it every two-three years. As I get older and older I find I'm far more interested in the exploration of parent-child dynamics than the racial/cultural stuff. One thing I've never quite understood is the purpose of Frances McDormand scene. It's a nice piece of acting by both parties, and it deepens your understanding of Sam Deeds' character, but it almost seems like it belongs in a different movie. I adore Lone Star. Has it ever had a good dvd/bd release? The dvd I bought years ago had no bonus features and a really crappy aspect ratio. I enjoyed Sayles' commentary track on The Secret of Roan Inish, would have loved to hear what he had to say about this one. The scene transitions in Lone Star are done so perfectly and unobtrusively. Having watched the movie umpteen times, it seems clear that every transition was done with simple practical effects of locking the camera down and redressing/relighting the set (or in the case of that first one where the camera goes from old Hollis's face down to the burrito plate and then back up to young Hollis' face in the flashback without stopping, I assume they started filming in the flashback location with a present-day backdrop that they pulled away as soon as the camera panned down, and had young Hollis jump into old Hollis's chair). 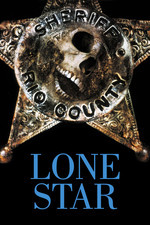 My first time seeing Lone Star was in a theater; I remember when the camera panned up from young Chuchu Montoya in the flashback hiding from Charlie Wade up to present-day Sam standing above him, there was an audible gasp from the audience. It just served the story so well -- for the major theme in the film, of how our past influences our present, those editing choices were the ultimate in 'show don't tell'. It shows that Sam had tried his damnedest to get away from the poison of Rio County, but it was already in him too deep, and threatened to harm others as well.